I didn’t like this product, when I first tried it that is. It felt like I was trying to rub a glue stick on my face, and so this wonder of a primer was relegated to a back drawer in my extensive beauty cabinet. And then one day I had a discussion with a Benefit consultant who told me the trick to this product – use it with Benefit Porefessional! What a difference that makes! It’s made by Benefit so the packaging is just amazing! 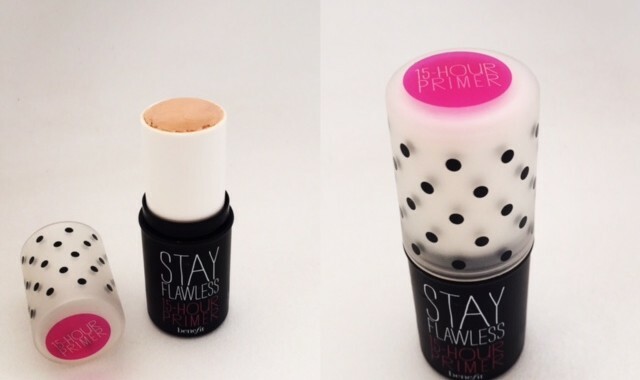 The Stay Flawless 15 Hour Primer is compact and cute, and operates with a twisty base (much like an oversized lipstick). I’m crazy about the striking pink and the polkadots! If used with Porefessional, Benefit’s Stay Flawless 15 Hour Primer is a dedicated and determined hard worker and it won’t let you down. Your make-up will stay firmly put! If used on top of Porefessional, this little primer is easy to use and does not feel heavy on your skin. Each of Porefessional (buy it here) and Stay Flawless 15 Hour Primer (available here) will set you back R395, which means that you are looking at almost R800 essentially just in primer. It’s expensive and although all of us at The Spa Life team have no objection to paying for good quality, I have to question whether it is really THAT much better that some of the other great primers out there. If you already have Porefessional, then Stay Flawless will complement your make-up routine and ensure that you continue to look flawless throughout the day and night. It’s a great product, just not on its own. Posted in Spa Product Reviews and tagged beauty, beautyblog, Beautyblogger, Benefit, Face, Primer.